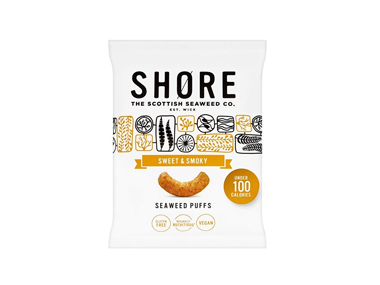 Buy Shore Seaweed Puffs Sweet & Smoky in the UK from our online shop or directly from our independent Scottish store. All natural crispy seaweed puffs delicately smoked with just a hint of sweet tomato. Our highly sustainable, clean and safe seaweed grows on the unique shores of Wick in Scotland. Expert pickers venture out in all weathers to hand-harvest the seaweed in season, at the right time of the day, in tune with the tides. Did you know that seaweed is a properly natural super food packed full of more minerals than almost any other vegetable? It contains a unique source of key macro and micro nutrients, antioxidants, electrolytes, vitamins and minerals, so your diet is easily boosted with protein, fibre, calcium, iron, iodine and vitamin C whenever you eat it. We sell real Shore and other Savoury Snacks directly from our shop in Scotland and online throughout the UK. View more products from Shore. Where can you buy real Seaweed Puffs Sweet & Smoky safely online? If you are wondering where you can buy Shore Seaweed Puffs Sweet & Smoky safely online in the UK, then shop with us. We are an actual health foods shop; with real people selling real foods and products. Our award-winning independent shop is located in Stirling, Scotland since 1976. You can buy our Savoury Snacks in store or safely place an order with us online or over the phone. Seaweed Puffs Sweet & Smoky - Shore Seaweed Puffs Sweet & Smoky in Savoury Snacks and Foods.